Despite Education Ministry promises, measure still penalizes yeshivas for any missing students, even those in reserve army duty. Despite promises by the Education Ministry three months ago, a draconian guideline authored by Finance Minister Yair Lapid (Yesh Atid) targeting yeshivas still remains on the books. The ministry, headed by Education Minister Shai Piron of Lapid's party, at the time hurried to promise that within days it would change Lapid's guidelines. Paragraph 16 of the guideline did not recognize any absence of higher yeshiva students -- including absences due to being called up for reserve military duty, or sickness. Under the guideline, a student fulfilling his service in the army could cause budget cuts to his yeshiva. The fixed guidelines were anticipated to make the fines on missing students more moderate as well, given that the draconian measures signed by former Finance Minister Yuval Steinitz days before the elections levied excessive fines. However, an Arutz Sheva investigation unearthed that despite the promises made by senior members of the Education Ministry, the promised changes were never carried out, and the draconian procedures continue to be the basis for review. 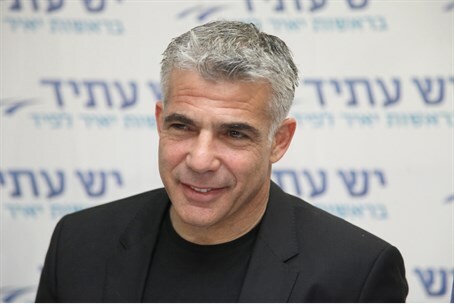 A source in the Education Ministry told Arutz Sheva that approval for the amendments was passed to Lapid's office, and that they need to be approved within weeks. Meanwhile, other sources reported that Lapid has been holding the approval back, with the goal of preventing any easing of pressure on the yeshivas. Lapid has been actively pushing for a change in law to enlist the hareidi yeshiva students to the IDF, going as far as to retroactively cancel funding to all yeshivas. The move, as well as the general Lapid-guided push for enlistment, has sparked massive hareidi protests. Piron's Education Ministry has come in for criticism in the past when it cancelled school trips to Hevron, where the Jewish patriarchs and matriarchs (other than Rachel) are buried. It also has been criticized for a program which allows teachers to peddle politics in the classroom, a particularly troubling move given the case of teacher Adam Verete who pushed a far-left agenda in his class.